A preview of banners that will be used in For the Fallen at Campbell Park this sunday. 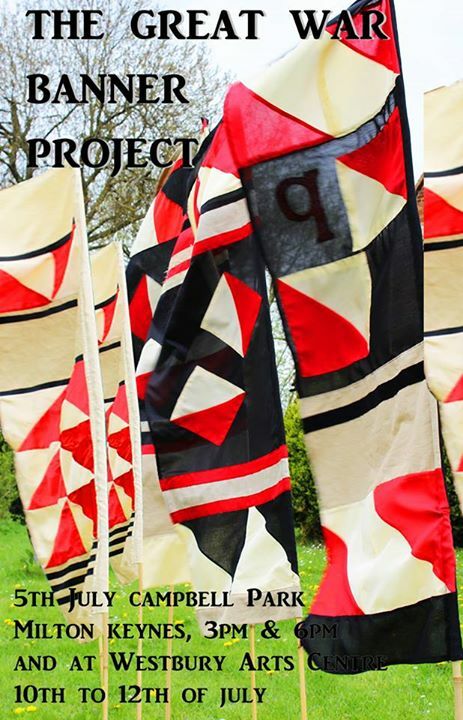 These beautiful hand-made banners, and many more, will be installed in the park to create a backdrop for a large-scale commemorative dance – join us 5th July, performances at 3pm and 5pm. These banners will also be installed at Westbury Arts Centre from 11th – 31st July for members of the public to enjoy. 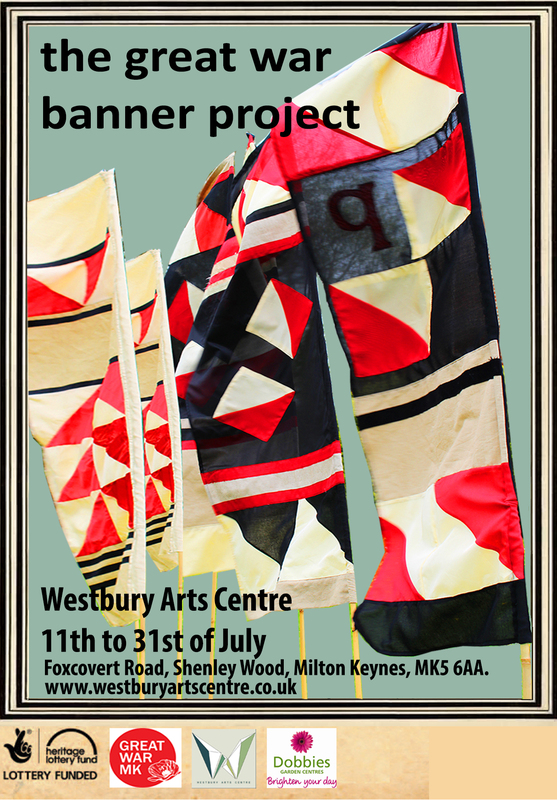 After the dance performance and banner installation on 5th July at Campbell Park, the Westbury Arts Centre banners will be installed in the arts centre grounds form the 11th – 31st July. This will be a great opportunity to appreciate the individual beauty of the banners as well as to experience the full impact of the banners when installed. The workshop, at Westbury Arts Centre, is suitable for all levels of ability, from beginners interested in learning textile skills, to those with advanced textiles skills. The workshop will be run by Vinny Stapley, a textile artist and teacher, who plans to work with a wide range of groups within the Milton Keynes community to create hundreds of Banners to commemorate those people who served in The Great War. The Banners made will form part of a procession of Remembrance and a Dance Performance in Campbell Park in July 2015. Vinny will come in with some materials, but it would also contribute to the project as a whole, if participants were able to bring in old WW1 photos or other mementos of family members to discuss and maybe integrate copies of these into their own banners. Here is a gallery of yet more poignant and beautiful Great War MK banners produced by MK College students working with textile artist Vinny Stapley and Westbury Arts Centre. 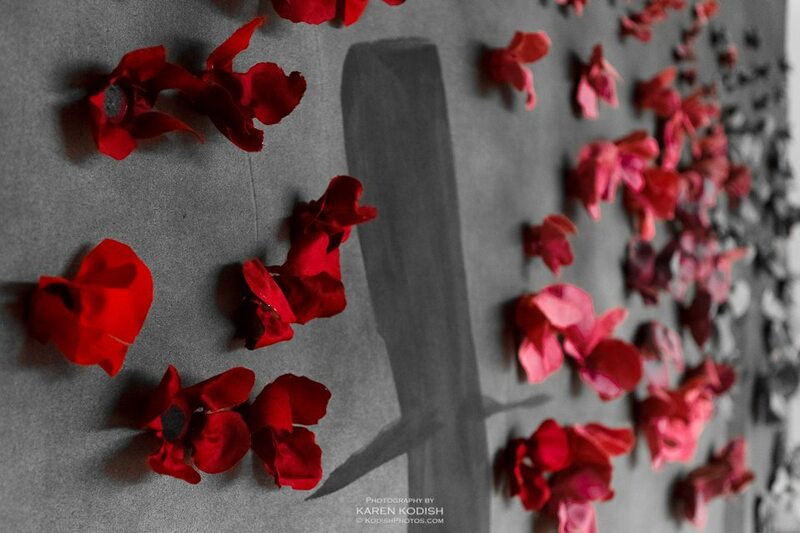 The final collection of over 500 banners will be installed in Campbell Park for their large-scale ‘For the Fallen’ dance performance on 5th July and at Westbury Arts Centre on 11th July. If you would like to be part of this project we are looking for people to create and donate poppies to be added to our banners. You can find out more here. These images show early development of For the Fallen, a commemorative dance piece that will take place at Campbell Park on 5th July. Inspired by WW1, the conflict and the stories or war, this dance will involve over 100 performers and will feature 500 banners created by the people of Milton Keynes. Choreographed by Helen Parlor, Effie McGuire-Ward and Chris Bradley this large-scale dance will be a beautiful act of commemoration. Helen, Chris and Effie are currently looking for dance groups that are interested in being involved in this project – young or old, amateur or professional they want to hear from you. More information can be found here: Dance Great War MK Flyer. The banners that will feature in For The Fallen are being created in artist-led workshops with experienced textile artist, Vinny Stapley. There are plenty of opportunities to take part in public workshops – see our events page, or you can use our template to create and donate a poppy to the project, more info here.